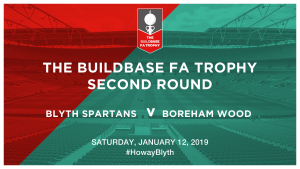 Blyth Spartans will host National League side Boreham Wood in the second round of the Buildbase FA Trophy. Following goals from Michael Liddle, Dan Maguire and Jamie Holmes on Saturday, Alun Armstrong’s men saw off Evo-Stik Premier team Lancaster City in the previous round to set up a tie with The Wood in the last 32. This followed after Spartans beat Marske United 4-1 in the fourth round qualifying, which proved to be the third win in what is a six-game winning streak for the club at the present moment. Currently 11th in the National League table, last season’s losing play-off finalists required extra-time to edge past Torquay United in a 3-1 victory. The game, which will present the first-ever meeting between the two clubs, is to be played on Saturday, January 12, 2019, at Croft Park.